San Jose is without a shadow of a doubt the tech capital of the world. Companies who operate there include Google, Apple, Cisco Systems, Intel Corporation, Yahoo, eBay, and a whole lot more. In fact, there is very little going on in San Jose that does not involve technology. If your company is based there and you have employees visiting from other parts of the US or from Europe and you need to be able to put them up in San Jose serviced apartments we can help. We can offer all types of accommodation in San Jose because we have been in the business of supplying short term accommodation throughout California for very many years. As a result, we have built up a portfolio of property owners and landlords who trust us to keep their properties occupied so that they maximize their rental income. This is a win-win situation because our landlords are happy and it means that we have more properties available as San Jose serviced apartments that we can offer to visitors to the city who need them. 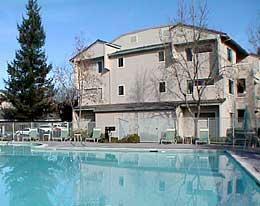 For many people, serviced apartments in San Jose are so much better than a hotel. If you are only staying for a week or two, a hotel may suffice, but any longer than that can become extremely tedious. You have to eat meals at the times the hotel serves them, which may not be what you want, whereas in San Jose serviced apartments you can treat the place as your own. You can come and go as you please, eat when you please, and generally live as you do at home. If you are staying for any length of time you will get to know your neighbors, and everything becomes much more friendly than staying in an impersonal hotel. You still get all the benefits of a hotel because the apartment is serviced, but there are none of the downsides, not the least of which is the cost of everything in a hotel. Everything in a hotel is an “extra”- even WiFi and parking in some hotels – and the cost of drinks in the bar is through the roof. Your employees will be much happier all round staying in a serviced apartment in San Jose – and of course happy employees work better and harder than those who are not happy or become depressed at the wearisome “sameness” of going back to a hotel every night. What’s more, as the employer who is paying for it you will be a lot better off financially. If you have employees visiting and need serviced apartments give us a call and we will customize a plan for you. This entry was posted in Serviced Apartments and tagged San Jose Corporate Housing, San Jose Serviced Apartment, San Jose Short Term Rental on June 7, 2018 by Lee McDonald.